Promote your brand, with a useful product, where it will get noticed fast. 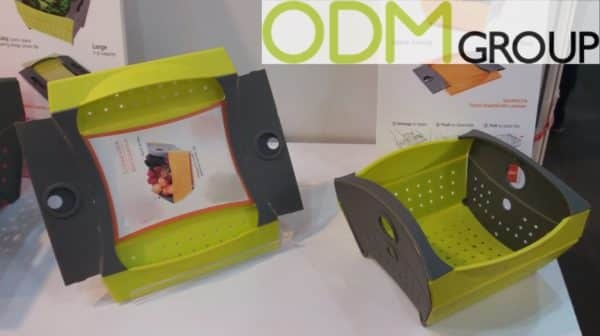 Such a unique kitchen gadget is the perfect product to be a part of your customers every day life and to increase your brand awareness as well as your sales through and after the campaign and offer of such a collapsible mini colander. Please refer the ODM-Code: 1618 to us, to get a quotation for this certain product. A colander is something everyone uses from one point to the other and is therefore a really useful tool to promote your brand. The fold-ability of this colander makes it to a very unique kitchen gadget which will save your space in your shelves or drawers. Its high-quality makes sure that this product can be used for a long term. This promotional product is customisable in color and branding and will be able to be customized to your brand or campaign you want to promote. Why should you think about such a Unique Kitchen Gadget? Brand awareness. To use a product, which will be used in the every day life of your customers, while cooking is really clever, as with a daily use, this will be noticed by a lot of customers. Looking at it, after cooking pasta or to wash your salad and apples, will definitely increase and expand the brand awareness. Additional customers. Advertising your brand with a product, which will be bought by your customers anyway, will satisfy your current customers and will also attract potential customers to prefer your brand and products. At ODM we have significant experience in product design, sourcing and manufacturing. We can help you with your marketing budgets effectively. Be sure to contact us if you are interested in finding out more information about such a Unique Kitchen Gadget. Please also have a look on kitchen gadget related blogs below.